"On behalf of the Ontario International Airport Authority I am pleased to recognize and thank Southwest Airlines for growing again at ONT," said Alan D. Wapner, President of the Ontario International Airport Authority (OIAA). "More flights to more airports helps ONT meet the increasing demand for air service in the Inland Empire while boosting the region's economy. "), a new destination airport for ONT travelers. In celebration of the new service, ONT is providing complimentary valet parking - a $20 per day value - through January 2017 to passengers flying the new route. ONT passenger board the inaugural flight to Dallas Love Field. Flight 2996's scheduled departure at 8 a.m. today (Sunday) arrived at DAL at 1 p.m. The sold out flight carried 143 passengers. Monday through Friday, the nonstop service departs ONT at 7:55 a.m. and arrives at DAL at 12:55 p.m.; on Saturday the nonstop flight leaves ONT at 7 a.m. and arrives at DAL at noon. The flights are flown with Wi-Fi-equipped Boeing 737-700 aircraft. At DAL, travelers can make convenient in- terminal connections with other Southwest flights to nearly 20 destinations. Returning flights leave DAL at 6 a.m. Monday through Friday, 6:40 a.m. on Saturday and 9:30 a.m. on Sunday, and arrive at ONT at 7:20 a.m., 8 a.m. and 10:50 a.m. respectively. 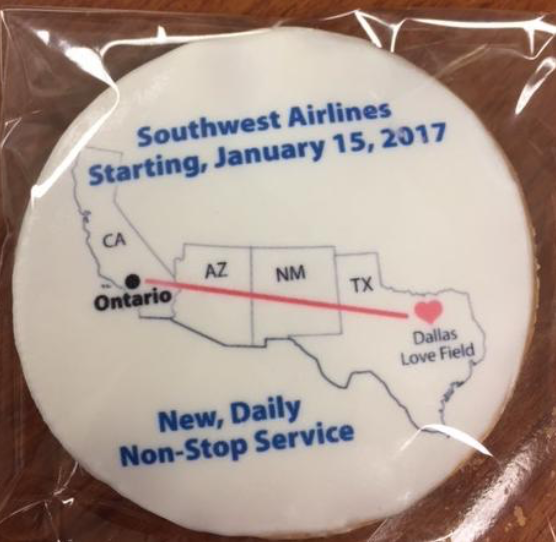 Passengers on the inaugural flight received commemorative cookies. "We salute Southwest Airlines for selecting ONT as one of the airports serving close-in Dallas Love Field," said OIAA CEO Kelly J. Fredericks. "This new service demonstrates Southwest's long-term commitment to the ONT market and confidence in the airport's future. As a token of appreciation to travelers supporting the new service, we are pleased to offer complimentary valet parking to passengers flying the new route this month." To receive the complimentary valet parking for up to five days, Southwest passengers flying to DAL need only show a paper or electronic boarding pass for travel on that day's flight. Passengers can pull their cars right up to the outer island directly in front of Terminal 4. An attendant collects their keys and flight information, and travelers then walk just a few yards into the terminal. The system monitors their flight status, taking note of any changes or delays to ensure their car is available curbside when they arrive. Southwest began service at ONT on May 15, 1985. Today it operates 31 daily departures to nine destinations: Dallas Love Field, Denver, Chicago Midway, Las Vegas, Oakland, Phoenix, Portland, Sacramento and San Jose. 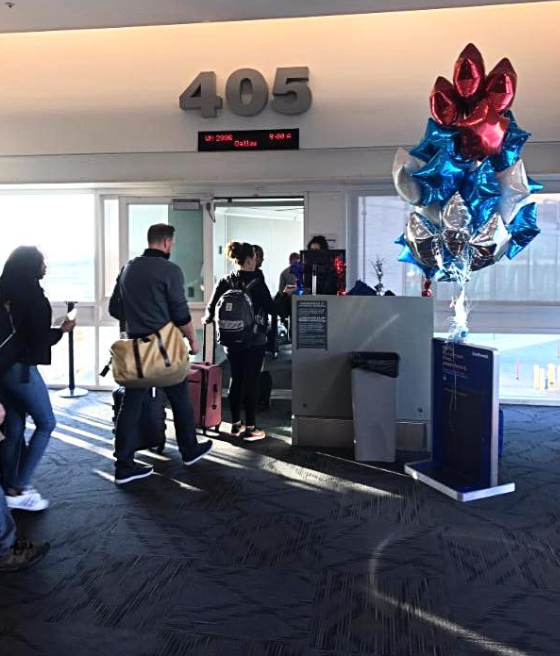 The new Southwest service to Dallas Love Field complements American Airlines' long- standing nonstop service between ONT and Dallas Fort Worth International Airport.